It's one of the first professional Russian children's theaters. 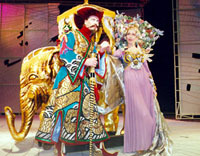 The theater was opened in 1922 with Petr Ershov's fairy-tale "Horse-Hunchback", which is still in the repertoire. Many writers, dramatists, directors, actors and artists collaborated with the theater. Works of many authors (Marshak, Kataev, Shvarts, Paustovsky, Roshchin, Okudzhava, Pogodin, Tendriakov, Razumovskaya, Oster and others) received their scene life here. Fairy-tales, classics and the best works of the world artistic conception are the main parts of repertoire. The main aim - not only to present classics to young audience, but also to develop its sense of art, to cultivate the sense of beauty. Briantsev created the theater as the universal, combining different genres and directions. So, its playbill suits such purposes. Ticket office: daily, from 11:00 a.m. till 6:00 p.m., dinner time - from 2:00 till 3:00 Tickets: 10-25 rbls.